I never, never do. The closest, I dream I am at the top of a soft hill and I start riunning to the bottom of the hill, and in slow motion I slowly become a bird, I glide around and it’s a very pleasurable dream, I never dream of walking on the wire. The New York Times reports today that Petit is at work planning another high-wire walk; this one in the fall in midtown Manhattan “in a very recognizable location.” It’s part of a series of walks across the country Petit has planned, to raise awareness for literacy. 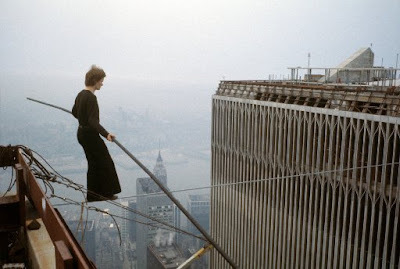 And what of the feature-film version of “Man on Wire,” based on Petit’s book “To Reach the Clouds”? Last summer, word was that Robert Zemeckis was attached to direct; today’s story just says that Petit is in talks with “a Hollywood producer.” Count me as someone who isn’t sure this story needs to become a feature film. The Towers are gone; the footage would have to be faked (no film footage exists of Petit’s achievement, though there are many still photos). “Man on Wire” is a witty and beautiful tribute to one of the most remarkable feats of daring we’ll ever see; let that be enough.